I just realized the last thing I posted was from December. It’s been a crazy start to 2014, with endless cold temps and snow, school cancellations, basketball games, and homework. And sadly, our family lost my husband’s father on New Year’s Eve, and my husband has been dealing with some other family health issues, and my grandmother passed away a couple of weeks ago. So hopefully now that the heavy stress has passed, and they are at peace, and we’re moving on as a family, things can settle back into a more normal routine. And hopefully spring will come soon, though it’s looking pretty bleak at this point. For my mom and her two sisters, I created remembrance pieces with angel wings, hearts, charms with special meaning, and their mom’s birthstone. Maybe a little bit corny, but a subtle way to display a small reminder of her. If you have a loved one you want to keep close to your heart, contact me and together we can design something that will capture his or her spirit. 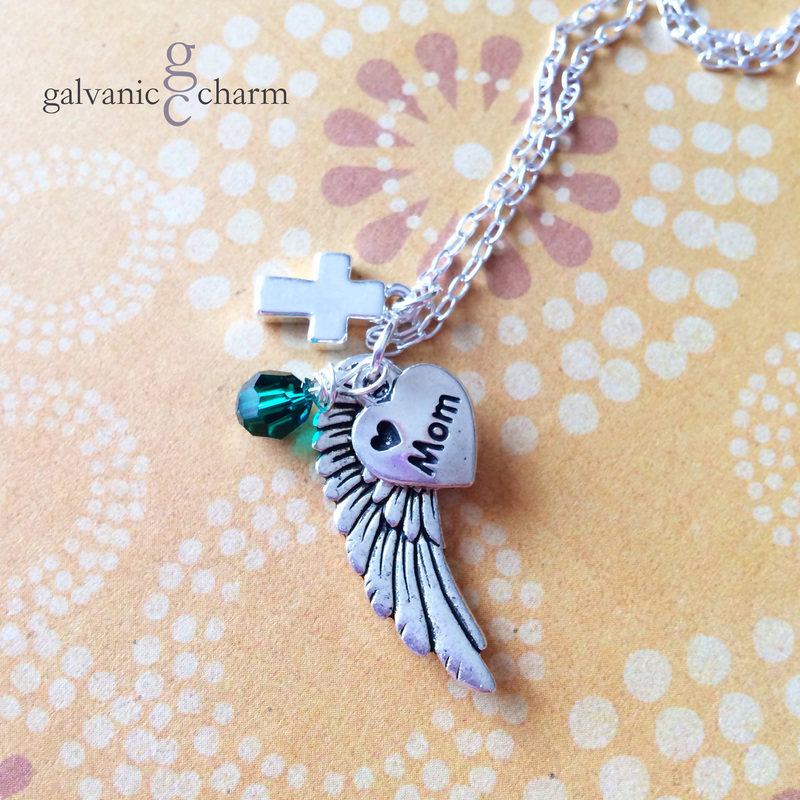 ANGEL MOM – Memorial necklace with pewter wing, small cross, and engraved “mom” heart charms, and wire wrapped Swarovski round crystal birthstone drop, pictured in emerald (May). 18″ silver plated light cable chain. $30 as shown. 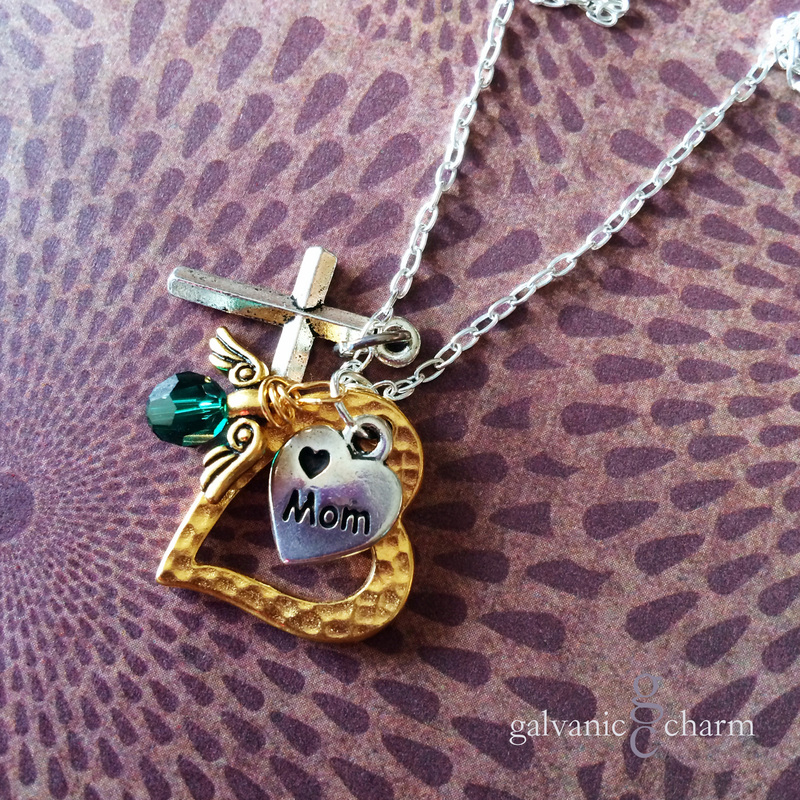 MOM’S HEART – Memorial necklace with pewter cross and engraved “mom” heart charms, 14k gold plated open heart, and gold wire wrapped Swarovski round crystal birthstone drop, pictured in emerald (May), with brass angel wings. 18″ silver plated light cable chain. $40 as shown. 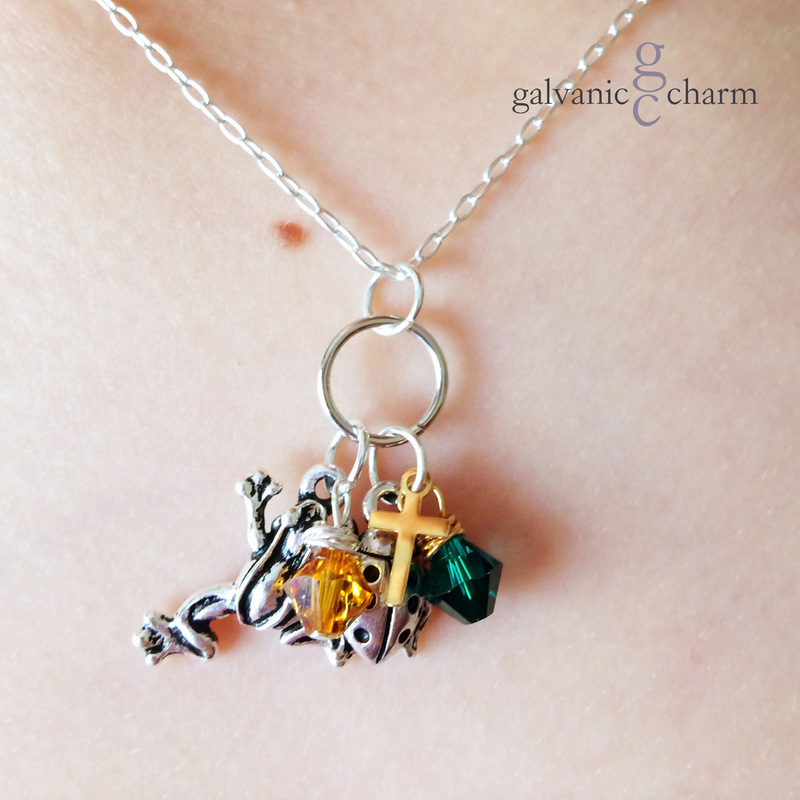 PATTY KATE – Memorial necklace with dangled pewter frog and ladybug charms, tiny 14k gold cross, and wire wrapped Swarovski crystal birthstone drops, pictured in topaz (November) and emerald (May). 18″ silver plated light cable chain. $35 as shown.